Ethical standards and principles are the foundation for maintaining public trust and every nonprofit depends on public trust for funding! 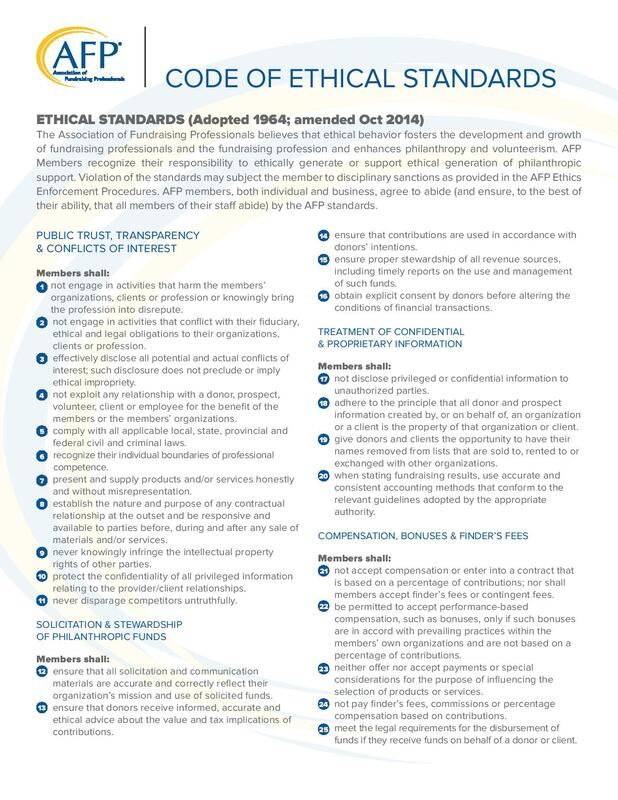 To ensure that philanthropy merits the respect and trust of the general public AFP has adopted a comprehensive Code of Ethical Principles and Standards of Professional Practice that provide AFP members with a set of guidelines and standards based on generally accepted principals for professional fundraising practices. 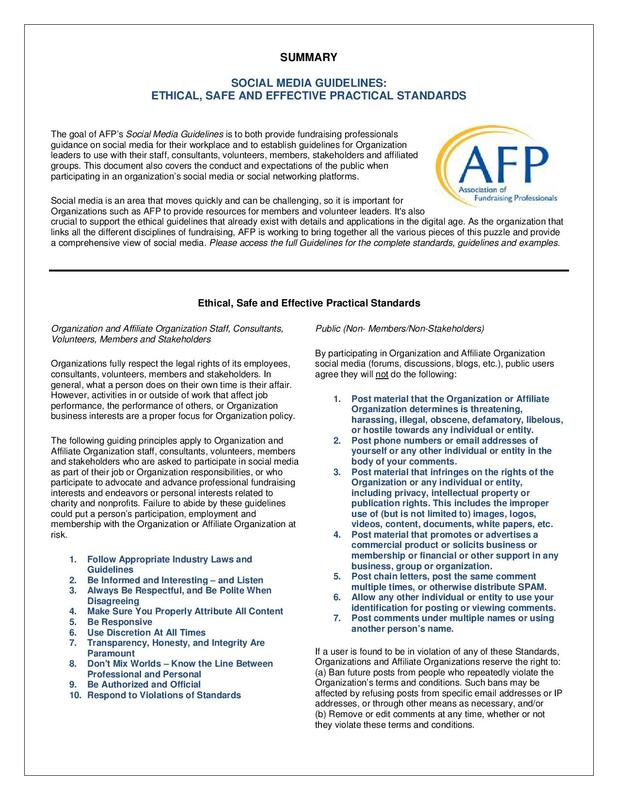 Every AFP member signs an agreement to abide by this code annually when renewing his or her membership. Here you can find the questions and answers to the Ethics Case Studies presented in the monthly Enews. You are the VP Marketing of a philanthropic institution, responsible for the annual allocation of contracts of significant value. You have traditionally used a number of different vendors, and have strong relationships with them. You occasionally test other vendors against your existing portfolio, but they have rarely been out-performed, and never to such an extent that there would be value in switching. You request proposals for your latest round of vendor comparison tests, and one vendor that you have previously considered, but rejected testing, uses the AFP International Conference to arrange a face-to-face meeting. At this meeting, he strongly implies that by replacing one of your existing vendors with his company you would make him both very grateful, and generous. A. Has a violation of the Code of Ethical Principles occurred? Answer: Yes. The vendor is in violation of standard 23 of the Code, which prohibits the accepting or offering of considerations for the purpose of influencing the selection of products or services. B. Shortly before the selection of test-vendors is to be carried out, you receive an invitation from the vendor to attend his client “Thank You” weekend in Southern California. In accepting this arrangement, has there been a violation of the Code? Answer: Yes. The vendor has violated standard 23 by offering the trip, and you have violated the same standard (standard 23), as well as standard 2, by accepting it. You are not a client of the vendor, and he is clearly offering the trip as an inducement to select his company. By accepting the trip, you have not only accepted an inducement for the purpose of influencing a selection of products and services, but you also have engaged in an activity that conflicts with your fiduciary, ethical and legal obligations to your organization. C. Would you still have been in violation of the Code had you attended the event, but insisted on paying the full cost of your trip yourself? Answer: Yes. You have compromised your position by attending the event. The possibility of attending future events through the selection of this vendor is clear, and though you have paid on this occasion the inducement is still there. This remains a violation of standards 2 and 23. Thank you for your interest in Fundraising Ethics. Do you have questions? 2. Contact your AFP Suncoast Ethics Chair, Nora Gunn, at (813)872-0979 ornora.gunn@baycare.org. 3. Contact AFP IHQ office via letter, email, or telephone with your ethics question. If the question has not been answered before, the office will forward it to the Ethics Committee for study. Emails should be addressed to rknight@afpnet.org. The telephone number is 703-519-8444. You are the vice president for advancement and alumni affairs of a small college. After many months of careful cultivation, you succeed in obtaining a pledge from a famous alum for the largest gift in the college's history. The only catch is, the alum insists that the college put his name on a building that was named for a previous donor (now deceased) as a condition of that alum's gift. You try to persuade the new donor to change his mind, but the donor is insistent. A. Should you refuse this gift? Answer: Yes. You have a responsibility to vigorously and ethically raise funds for your college while ensuring that the intent of all donors is honestly fulfilled. Presumably the naming of the building (in perpetuity) was a part of the original gift agreement with the previous donor, and to make any changes would be a violation of Standards #12 and #14. You must review the original gift agreement and may wish to get advice from counsel if the gift agreement is complex or if one was not written. Assuming the Board approves significant naming opportunities, you will need to take the matter to your Board with the advice that the original donor’s name remain on the building. B. Suppose the new donor agrees to a proposal to name the building jointly for both donors. Would this arrangement pass muster under the “donor consent” standard of the AFP Code? Answer: No. The proposal on its own would not pass the “donor consent” test. The guideline to Standard #14 notes that a member may meet with surviving family members or representatives to discuss potential alteration in the original conditions of a gift. C. Suppose the college president and the Board of Trustees vote to rename the building for the new donor. Should you resign? Answer: Yes. For this scenario, we will assume that the president and Board have the ultimate authority to accept or decline a gift (certainly a gift of this magnitude). If the Board and President are in breach of the terms of the donor’s gift agreement and/or are not complying with approved donor recognition and naming policies, you should resign from the college. You will not be able to adhere to the AFP Code nor practice your profession with integrity, honesty, and truthfulness at this institution. 2. Contact your AFP Suncoast Ethics Chair, Nora Gunn, at (813)872-0979 or nora.gunn@baycare.org. September Ethics Case: Whose Line is it Anyway? A small, fundraising company retains the services of a freelance web specialist to re-position and re-design its web presence, in order to more effectively exploit this channel for its marketing efforts. The company is delighted with the results of her work and the value for money offered. Unfortunately, what the company does not know is that the designer has plagiarized some of the new material introduced onto the website, and that the intellectual property (IP) owner has not been properly credited. A. Is the company in violation of the Code of Ethical Principles? Answer: Yes. The company is in violation of standard 9 of the Code because it is held accountable for the acts of a third party such as a freelance web specialist, much like the company is held accountable for the acts of its own employees. The company should have made more strenuous efforts to ensure that no violation had occurred. The fact that the company was unaware of the act of plagiarism could be raised as a defense in an ethics enforcement proceeding; however, it does not negate the fact that a violation of the Code has occurred. B. Suppose the company were informed of the violation by the IP owner, and referred the matter to its next board meeting, three months hence, for a decision on what action to take. Would this be a violation of the Code? Answer: Yes. On being informed of the infringement, the company should take all reasonable steps to promptly rectify the situation, as it is knowingly infringing the IP rights of others. C. The company approaches the web designer to demand that she rectifies the situation, and either properly credits, or removes, the offending material. The designer demands a further fee for so doing, which the company refuses to pay on principle. Is the company in violation of the Code? Answer: It depends. If the company stands by its principles and refuses to pay, and then takes no further action due to being in a stand off, then it remains in violation of standard 9 of the Code. If however the company goes on to retain a third party to rectify the situation, then it is no longer in violation as it has taken reasonable steps to remedy the breach. 3. Contact AFP IHQ office via letter, email, or telephone with your ethics question. If the question has not been answered before, the office will forward it to the Ethics Committee for study. Emails should be addressed torknight@afpnet.org. The telephone number is703-519-8444. It is April 15 (U.S. tax filing deadline), and you are in your first week as director of development for a charity when you get a phone call from the charity’s largest donor. The donor is the chairman of a Fortune 500 corporation who has given several million dollars to the charity and already has a building named for him. He announces that his tax advisor says he needs to make another donation for the previous year and that he is sending over a check for $100,000. He asks you to prepare a letter of acknowledgment dated prior to last December 31. Before you can think of what to say, he hangs up. A. What should you do? 1. Prepare the letter of acknowledgment thanking the donor. 2. Call the donor back and tell him you cannot accept the gift on these terms. 3. Discuss the matter with your CEO. 4. Ask the CEO to decide what should be done. Answer: Discuss the matter with your CEO. What the donor has proposed is a violation of the law, which is paramount. Accepting the gift on the terms proposed would also be a violation of Standards #2 and #5. This is your first week on the job. Encourage your CEO to make the call; if he/she won’t, make the call yourself. it, I’ll write the letter.” What should you do? 1. Warn the CEO that it would be a violation of the AFP Code to comply with request. 2. Warn the CEO that it would be illegal to comply with the request. 3. Ask the chief financial officer for an opinion. 4. Keep quiet; this is a matter between the CEO and the donor. Answer: Warn the CEO that it would be illegal to comply with the request, as well as a violation of the AFP Code. This is a clear violation of Standards #2 and #5.
charity has done similar favors for some of its large donors. What should you do? 1. Continue the practice; it’s working. 2. Warn the CEO that it would be a violation of the AFP Code to continue this practice. 3. Warn the CEO that it would be illegal to continue this practice. Answer: Warn the CEO that it would be illegal to continue this practice, as well as a violation of the AFP Code. Fundamentally, the same explanation that applies to the previous question also applies here. To protect one’s integrity, the choice to resign is an option for consideration. You are director of an international emergency relief program. Within one month, three large scale disasters occur — an earthquake in Mexico, a hurricane in the Pacific, and a flood in the U.S. Because of the severity of the disasters and the thorough, constant media coverage, donations have been pouring in. Most gifts are designated to either the earthquake or the hurricane victims; however, many people in the U.S. have lost their homes in the flood and are in desperate need of help. As time passes, you see that the relief needs of the hurricane and earthquake victims will be easily met by 60% of the relief money coming in, but more than 95% of the money is designated by the donors for the hurricane and earthquake, leaving you with insufficient funds to meet the needs in the U.S.
A. Would it be a violation of the AFP Code to use some of the donations designated for the earthquake or hurricane victims to assist victims of the flood? Answer: Yes. This would be a violation of Standard #14 – Members shall take care to ensure that contributions are used in accordance with donors’ intentions. B. To comply with the Code, should you return the donations that were not needed in the areas for which they were designated? Answer: It depends. A member could contact a donor, explain the circumstances and request permission to use the funds for a different disaster (Standard #16). If permission is not provided, donations should be returned in order to comply with the Code. A list of helpful works in the study of ethics and fundraising. 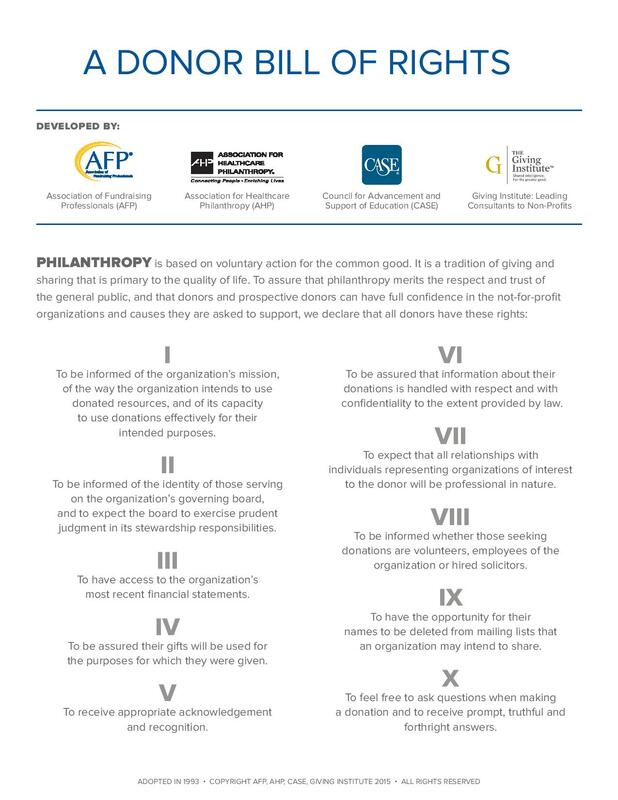 The foundation of philanthropy is ethical fundraising, and a key mission of AFP is to advance and foster the highest ethical standards through its Code of Ethical Principles and Standards. 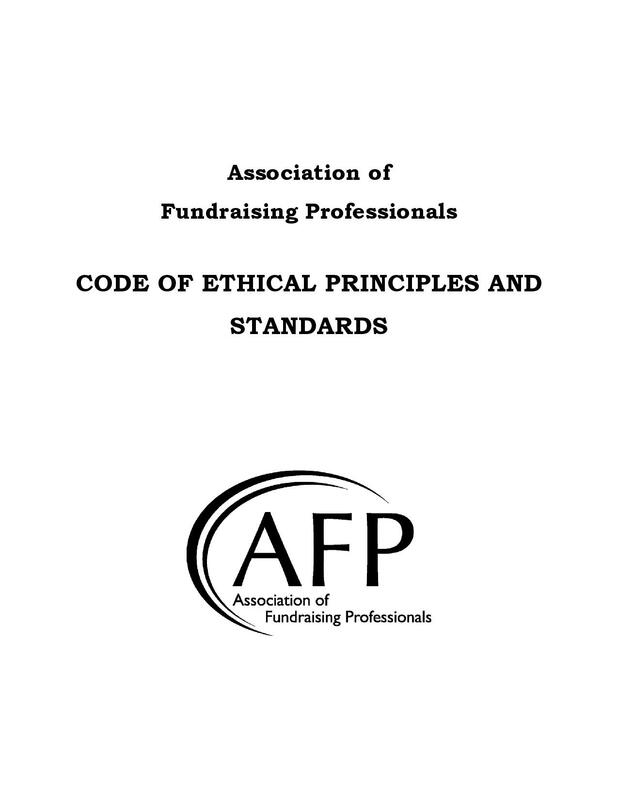 These guidelines and examples are provided to assist AFP members and others in interpreting and using the Code of Ethical Principles and Standards. They are intended only as suggestions to help guide thinking about ethical behavior and not as prescriptions for all possible situations.